We loved meeting folks at “Best of the North,” and they kept us very busy! This post is a very personal thank you to my clients, family, friends, fellow stylists, business owners and risk-takers, and my phenomenal staff at Statements in Hair. Last October we participated in the “Best of the North” event presented by Cincy Magazine at the Manor House. 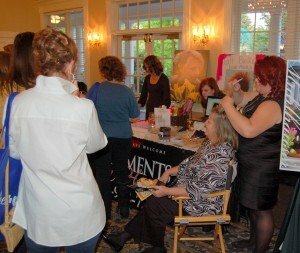 We styled hair, gave away gifts and goodies, and met so many new people. Long story short, we ended up being voted by those present at the event into the Master Stylist finalist category, and an online vote resulted in our winning. My first reaction when the idea of getting involved in this event was, “I don’t have time, I have too much work, I can’t deal with it right now!” I was convinced otherwise by my enthusiastic staff, and it proved to be the best business decision of my career. We have new clients, new partners and new friends as a result. I write all this, not to pat myself on the back, but to serve as a “heads up” to fellow independent business owners and entrepreneurs. We know all about risk, we live it every day, but we can also become complacent, blind to opportunities, because we feel overwhelmed most of the time. Conscious or unconsciously, it seems easier to just stay the course. I hope for all of you that 2013 is a “heads up” year for you. Keep your eyes open for opportunity! Maybe it starts with walking to the office or shop next door and starting a conversation, sharing some resources. You never know where it may lead.